A veteran Labour MP from Leicester has died suddenly at his office. Leicester South MP Jim Marshall, 63, represented the constituency almost continuously since 1974. 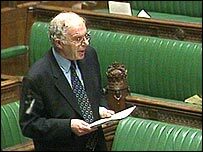 Dr Marshall had two stints on the frontbench - as a Home Affairs spokesman under Michael Foot and as a Northern Ireland spokesman under Neil Kinnock. He lost his seat in 1983 by seven votes, but regained it in 1987. He was on the left of the Labour Party and defied the government over issues such as changes to incapacity benefit, freedom of information and reforms of legal aid provision. Dr Marshall was also a Eurosceptic, defying party whips to vote against the Maastricht bill. Prime Minister Tony Blair paid tribute to Mr Marshall, describing him as "a very popular figure in Parliament". A Labour colleague, Nottingham East MP John Heppell, who is a government whip, said Mr Marshall's death was "a complete shock". Leicester East MP Keith Vaz said: "This is a terrible loss - he was a man of great principle and we will miss his greatly."